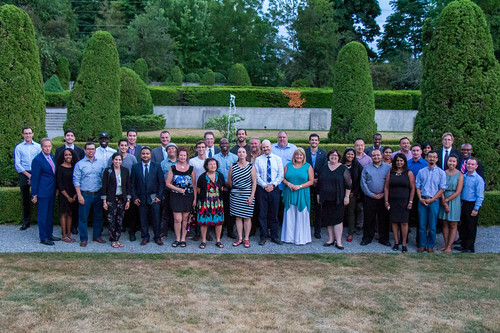 On June 27th, the ELN travelled east to connect with leaders and learn about the exciting work taking place in Durham Region! Co-hosted by the Economic Development & Tourism Division of Durham, a group of 30+ ELNers took the GO Train to Whitby where they received an interactive tour of some of Durham Region’s most innovative organizations including the Lakeridge Health Education and Research Network (LHEARN Centre) and the Abilities Centre. Learn more about this exciting event in this piece about the event, or below from one of our ELN Executive 2016 Events and Programming Leads, Imanzi Kayitare, and check out more pictures! As a Mississauga resident working in Toronto, I don’t have much opportunities to explore the GTHA as I would like to, including getting out to Durham Region. Before the Durham Region tour with the ELN, I had little understanding of the dynamics of the region, but I was pleasantly surprised to learn about the many emerging opportunities and advancements in innovation. This is a region that is on the move and developing quickly! One of the highlights of the tour that I enjoyed was the Whitby Abilities Centre. It was great to see a community hub space that connected sport, skills development and art for all ages and abilities. It was also exciting to explore the Lakeridge Health Research facility, which is spearheading the development, testing, and scaling of cutting edge technology being from Durham to the rest of the province. While on the tour I also had the opportunity to interact with senior leaders across different sectors in Durham for an exclusive panel discussion. I particularly enjoyed hearing Durham’s police chief his strategies to improve community engagement through the diversity of its workforce and technology enhancements to improve service delivery. I was also encouraged to hear that Durham Region has a thriving social innovation and startup incubator space through the Spark Centre. I believe that greater collaboration can be forged connecting the start-up community in Durham to diverse networks in Toronto and surrounding areas. Attending the Durham tour was an eye opener on the endless potential that exists within the GTHA as we become more integrated. The tour helped me better understand the initiatives and issues that are happening beyond Toronto’s core. It’s easy to read about something in the news and understand from a distance, but its different engaging up-close through a regional tour to learn and share best practices on city building. I’m happy I attended the Durham tour—a great learning experience and I’m looking forward to more!